Memorabilia UK are happy to provide the following list of additional services to the autograph buyer or collector. 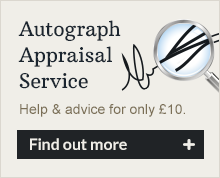 Our Autograph Appraisal & Advice service offers rapid online help for a small £10 pounds charge. We actively seek to buy autographs, especially 1960-70s pop music items in their raw state from the general public and original obtainers. We can help source autographs for clients through our long established network of trusted contacts. We DO NOT however offer a free valuation or any sort of detailed authentication service to unknowns. Most answers to general autograph questions are answered in our very detailed free Advice section.